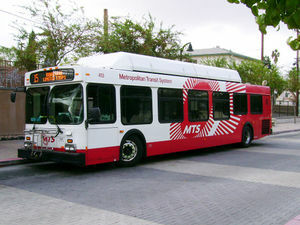 San Diego MTS provides local and regional transit in southern San Diego County. MTS covers the cities of San Diego, La Mesa, El Cajon, Lemon Grove, Poway, Santee, National City, Imperial Beach, Chula Vista, and Coronado. MTS also provides rural service to Eastern San Diego County. MTS operates buses and the San Diego Trolley. MTS connects with Coaster and Amtrak Pacific Surfliner trains, NCTD Breeze buses, and shuttle service crossing the border to Mexico.